Pepsi and Mountain Dew will soon be releasing their soft drinks without the use of high-fructose corn syrup. The beverage manufacturers have opted to use real sugar, which some claim to have better taste and nutritional value. According to bevreview.com, Pepsi has been experimenting elsewhere with sugar-sweetened drinks. 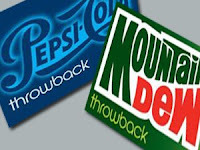 We reported last February about two such entries… Pepsi Raw in the UK and Mexico's Pepsi Retro. It's nice to see some of this finally coming to the States. What makes this interesting for our purposes stems from the need that the bev companies have to make it seem almost retro to use sugar. Will nostalgia prove to be a benefit in marketing this to the American population, should they have taken another avenue? I think there is definitely a market out there for non-HFCS sodas. Whether the plug to the "older" population works, I don't know. But I do think people will buy it, especially if the price is reasonable.